SPRINGFIELD — In an effort to curb the spread of invasive species and protect the environment, State Sen. Linda Holmes supported legislation signed by Gov. Bruce Rauner this week that adds more plants to the state's list of exotic weeds. The Exotic Weeds Act prohibits the sale of invasive flora that threaten the ecosystem in Illinois. The updated Exotic Weeds Act adds a variety of new plant species to the list, including varieties of exotic bush honeysuckles, olives, salt cedar, poison hemlock, giant hogweed, Oriental bittersweet (Celastrus orbiculatus), Japanese, giant and Bohemian knotweed, among numerous others. The legislation was Senate Bill 681. It becomes effective Jan. 1. SPRINGFIELD — Working alongside Attorney General Lisa Madigan to crack down on unlicensed employment agencies, State Sen. Linda Holmes advanced a plan out of the Illinois Senate Wednesday. The legislation seeks to address regulations that have not seen substantive updates in decades and that currently provide inadequate tools for the Attorney General’s Office to enforce compliance. Workers who have been placed by such unregulated agencies have alleged numerous instances of abuse they have suffered at the hands of employers, including being made to work 6-day work weeks of 12-hour shifts to pay off referral fees, being referred to jobs that pay below the minimum wage, being housed in crowded and substandard conditions and being denied medical treatment for on-the-job injuries. In addition to providing civil penalties for such violations, Holmes’ proposal directs the Department of Labor to create and maintain a database of employment agencies with suspended or revoked licenses, requires employment agencies to keep records of their placements longer and provides whistleblower protection to employees who report misconduct. The legislation is Senate Bill 1859. It proceeds to the House for consideration. 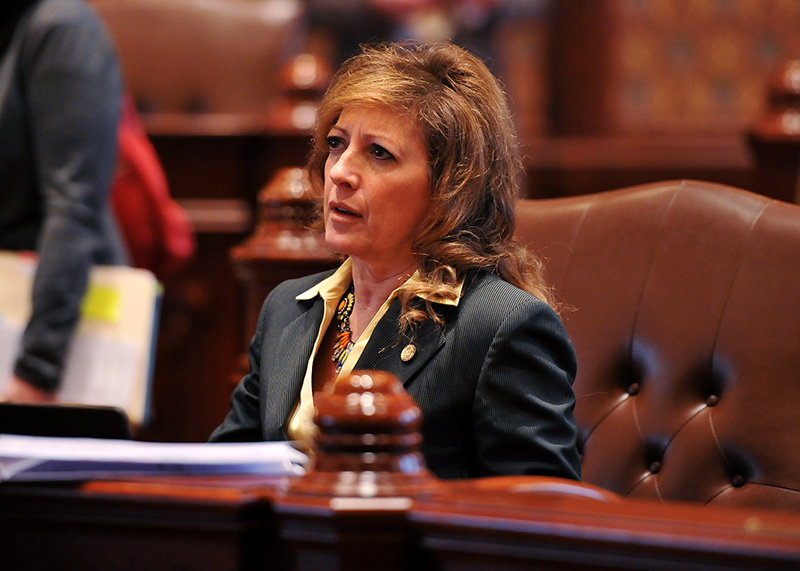 SPRINGFIELD — Collaborating with Illinois Comptroller Leslie Munger to enforce greater fiscal discipline and seek out efficiencies and transparency in state funding, State Sen. Linda Holmes sponsored two proposals that passed the Illinois Senate today. Senate Bill 1404 further clarifies a law meant to bring the accounting practices of all state agencies into line with one another. A 2011 report by the Auditor General’s Office discovered that the state had been using more than 260 different accounting systems, many described as “antiquated.” The proposal clarifies the auditing practices of state agencies that don’t have their own internal auditor. Originally introduced by Comptroller Judy Baar Topinka before being taken up again by Munger, Senate Bill 1405 creates a task force with the aim of studying state funds and searching for funds that can be consolidated or otherwise eliminated. Doing so would potentially promote greater efficiency and transparency in state operations. Currently, the state maintains over 900 funds. In contrast, the State of Wisconsin maintains about 60 funds, Comptroller Munger said. “I thank Sen. Holmes for her leadership on these two important bills in the Senate that will go a long way toward improving efficiencies and increasing transparency in state spending,” Munger added. The two pieces of legislation proceed to the House for consideration. Working alongside Attorney General Lisa Madigan to crack down on unlicensed employment agencies, State Sen. Linda Holmes advanced a plan out of committee Wednesday. Agencies that refer jobseekers to employers for a one-time fee are regulated under an act that has not seen substantive updates in decades. Those regulations also provide inadequate tools for the Attorney General’s Office to enforce compliance.